Digital holographic microscopy allows optical path difference measurement. 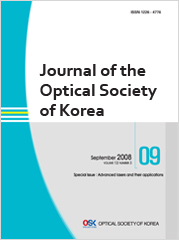 Optical path difference depends on the both refractive index and morphology of sample. We developed a dual-wavelength in-line digital holographic microscope that can measure simultaneously the refractive index and morphology of a sample, providing highly precise three-dimensional information. Here we propose theoretical and experimental methods for dual-wavelength in-line digital holographic microscopy. The measured data were reasonable, although there was data error. By improving the experimental method, we could measure the refractive index more precisely and obtain more accurate three-dimensional information on samples.